• But we had heard the same talk as we hear now: Shoaib Akhtar, Sami, Kaneria, home pitches, home advantage. You will hear these things all the time, Shekhar. The talk before a series has not changed in the nine years that I have been playing this game and probably never will. • But there’s this feeling that it’s Pakistani bowling versus Indian batting. Our batting, as we’ve seen lately, has shown some change. We were nearly exposed by South Africa, we were exposed in at least one match by Sri Lanka. We have a good batting line-up and that’s been our strength, there’s no doubt about it. Over the last four-five years, we’ve had a group of players who have come together and played probably some of their best cricket as batsmen. Whether you look at what Sachin’s done or Sehwag, Laxman, Sourav... I mean, all four or five of us have got together and played probably some of our best cricket at this point of time. • But right now there’s a patchiness. There is a certain amount of patchiness to it, but there’s some quality to it as well. And that will be a key part of the series. Our batting coped really well with their bowling the last time. Veeru got about three hundred, Sachin nearly got a double hundred, I got a double hundred. We can repeat that. • But you have got a much better tail now, a much shorter and better tail. I think one of the challenges for me as a captain and for us as the team management is how do we get the best out of our players, how do we make them improve not only as players but also as individuals, how do they grow. I think that by giving them different challenges, different opportunities, we are seeing that not only are they relishing it, they are also growing and becoming better cricketers. That’s the goal. • Rahul, talking about that last series, you talked about your double hundred, Sehwag’s triple hundred and Sachin’s near-double hundred. A question about that. I mean, questions have been raised about when you declared and why. Have you thought about it? Or did you think at that point that an individual’s double hundred wasn’t that important? Well, I was never sure that the Test was going to finish on the fifth morning like it did. I mean, it finished 80 overs before the end of the day and if I had known that we were going to have that much time, I would not have declared at that point of time. But, I was not privy to that knowledge and I wanted to have a crack at the Pakistani batsmen that evening. That’s what I felt would give us the best chance to win that match and we were in a position to. It was Sachin’s knock and Veeru’s knock that had actually got us into that position. I think there again a lot was made out of it. Sachin and I have respected and known each other for so long and we get along really well. Between us, the issue was sorted out as quickly as possible; we spoke about it and what we said is obviously something that will remain personal. I really admire and respect him and appreciate the way he handled not only that episode but a lot of things in his life. • I remember in that very innings when he was bowling and he (got) Moin Khan... the joy on his face and you suddenly realised that there was no pain of having missed the double hundred. Like I said, I have been very privileged and lucky in my career and one of the joys has been being able to play with cricketers like Tendulkar and Kumble and Srinath, Sourav Ganguly and now Sehwag and Harbhajan. These are players who are and will be great players. • Rahul, let’s talk about captaincy. It is often believed that a player’s own attitude to the game reflects in his captaincy. How do you define your own approach? I know your answer will be that you have had the job for too short a time. That will be my answer, thank you! But I don’t think that the way you bat is necessarily the way you will captain. I think that’s a cliche. People say, oh, he’s an attacking player, so he’ll captain attackingly. Or, he’s a defensive player, so he’ll captain defensively. I think they are two different things. You bat according to your skill level, according to the way you know how to bat, the way you have grown up batting; and you captain according to the way you think about the game, according to the resources you have. I don’t think the two are related at all. • But your own batting has evolved. It has, over the last four or five years. 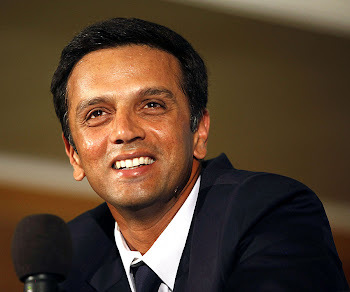 I have played some of my best cricket in these years and I have grown up as a player and as a person. • In fact, John Wright said you are fitter in your 30s than you were in your 20s. That is probably true. I think the awareness of fitness has always been there, but it’s probably been more professional since 1999-2000. The game’s also become professional; the rewards for playing at this level are also huge. • And how has the business of captaincy changed? How do you motivate players? Because this is a team of stars. I don’t think I need to motivate people to play for India. I think people should be motivated to play for India, and they are. If you look around and see who are the great players that you’ve played with, you realise you have never needed to motivate them to play for India. Those are the kind of people you are looking for in a team. You are looking for people who not only motivate themselves but also inspire other people. I think the mistake you can make in teams is to club people who are not that keen, not that motivated, who don’t have the hunger to improve. And if you get them in an organisation or a team, with a group of motivated people who want to do something, you can end up demotivating the people who want to do something. You run a newspaper, and I think you’ll agree with me that in any team or any organisation, a few people, if they are not motivated and if they are not keen for the organisation to do well, they can demotivate the actually keen people. It is important to get those people out of the way. • The difference is when we find people like that, if we wish to we can tell them to go. It doesn’t become a public story. It is not something on which one billion people have a say. Well, the coach and I don’t have a say in everything. There is a chairman and five selectors who watch more domestic cricket than we do. A lot of the time I have not even seen some of the players the selectors are talking about. • But tell me, Rahul, as a leader, if you saw a negative influence developing around somebody, now that you are captain, how would you deal with it? I think there are two ways to deal with it. You either talk to the people involved and try and get them on track; and if you feel that people are demotivating other people in the team, and are not playing for the team, then you have got to take some hard decisions sometimes. • Have you seen that happen? That’s not good in any team. What I’m saying is not rocket science. Anyone who brings a brooding presence, or anyone who doesn’t want to improve — I am not just saying that people need to be nice, but what I am saying is that people need to constantly improve. Because if they improve as individuals, the team grows with them. But if they stagnate, and if they don’t want to improve, then they bring down the whole team with them. So with people like that, obviously tough decisions have to be taken. But that’s international sport. And there are no tough decisions. What you are actually doing is you are making a decision that helps the majority.